One of my favorite books is the 1988 precursor to Dan Brown's The Da Vinci Code, otherwise known to more discriminating readers as Foucault's Pendulum, by Umberto Eco. 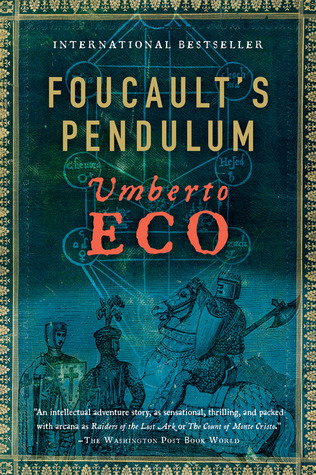 Foucault's Pendulum tells the fascinating story of a group of intellectuals who - for the sake of pure entertainment value - begin re-writing the history of the world by making a few simple assumptions about a lost crypt carving uncovered by an eccentric explorer. I won't spoil the end for you, but the book is largely about how different the world looks if you make a few different assumptions about the things you think you know. Fascinating. On a related note, I have found myself engaging in jokes with friends and family in which I start from a flawed assumption about what's been said, and I quickly construct an alternative universe that reconciles the false assumption, resulting in a patently ridiculous view of whatever situation we happen to be talking about. If I pull this off in total deadpan, people really think I'm being serious, which actually sweetens the joke for me. More commonly, though, people know I'm pulling their leg, but they can't put their finger on where the joke ends. Either way, this kind of joke ends up being funnier for me than for others. It just makes me laugh - I'm not sure why. Try it out on your friends and see if it works for you, too.